Did you know that there are more than 1,000 varieties of apples grown in North America and dozens grown in Southern British Columbia? To help prepare you for apple season, here’s an overview of the apples we grow at Taves Family Farms. By doing a little research before you visit, you’ll make the most of your time in our U-Pick orchards. Be sure not to miss our all-time favourite, signature apple– the Jonagold! From eating to baking, it pays to plan ahead. If your apple is too sweet, your pie could be soggy, and if it’s too tart and firm, you might scare your kids off of apples for months! Alkmene: The flavour is quite strong, similar to a granny smith. That’s why the Alkmene is great for baking! If you like a strong, tart apple early in the season, then give this one a try. 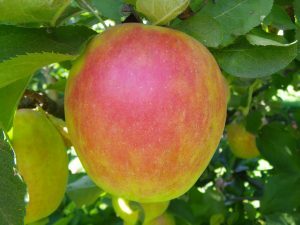 Ambrosia: Discovered by chance in a British Columbia orchard, this sweet beauty is similar to the Golden Delicious. A perfect snack that is not too firm and not too soft. If you bake with it, be sure to use less sugar. Fuji: Originally grown in Japan, the flavor is predominantly sweet. Yet, there’s also a tangy fizz. Fujis are superb for eating fresh or adding to salads. Gala: One of the most widely grown apple varieties in the world, and a mainstay of the produce section. If you want a reliable, sweet easy-eating apple, Gala is hard to beat. Honeycrisp: The Honeycrisp earned its name from being as ‘sweet as honey’ and, extraordinarily, crisp. They tend to be jumbo-sized, and are great for eating on their own or in salads, sauces, and baked goods. Jonagold: Our longstanding favourite, Jonagolds are a cross between Golden Delicious and Jonathan apples. They are firm, crisp, crunchy, and sweet. Truly versatile, these beauties are great for just eating or adding to salads. They also bake well, keeping their firmness inside your next apple pie! Sunrise: The perfect blend of sweet and tart, Sunrise apples are one of the first varieties to be harvested each year. They are excellent all-purpose apples. Spartan: These crunchy, sweet apples are great in lunch boxes, briefcases, and purses. Spartans are excellent all-purpose apples. Elstar: Similar to the Golden Delicious, this is a sweet, versatile apple that’s very popular across Europe and is making headlines in BC. Bartlett Pears: Ok. You caught us. True. A bartlett pear is not an apple, but we love them anyway. Bartlett pears have clear, yellow skin when ripe and the flesh is juicy and sweet, with a fine-grained, smooth texture. They’re downright delicious on their own and since they keep their flavour even after heating, they’re a natural for canning. The Applebarn U-Pick at Taves Family Farms opened on August 19. We look forward to welcoming everyone back for another great season of fall family fun!